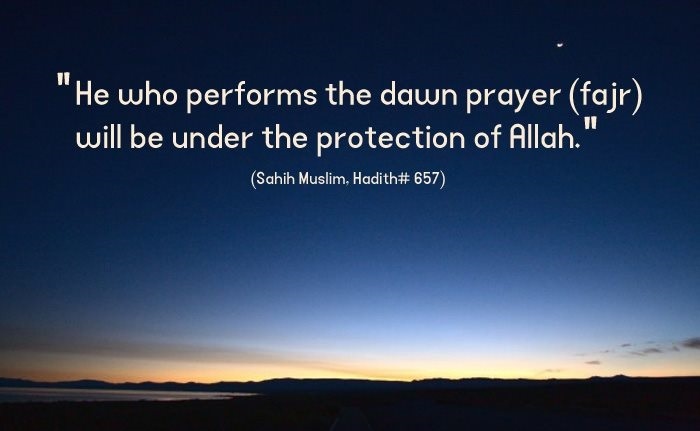 A beautiful hadeeth about the importance of Fajr prayer. 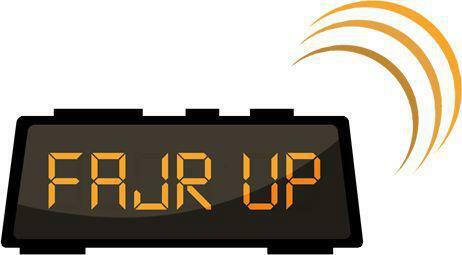 Al-Bardayn are Fajr and 3Asr. Commentary: It is a must for every Muslim to offer every Salaat regularly but there are some prayers (Salaat) which cannot be performed punctually unless one takes special care of them. This is the reason some additional merits have been mentioned in this Hadeeth so that people exercise extra effort for performing them. 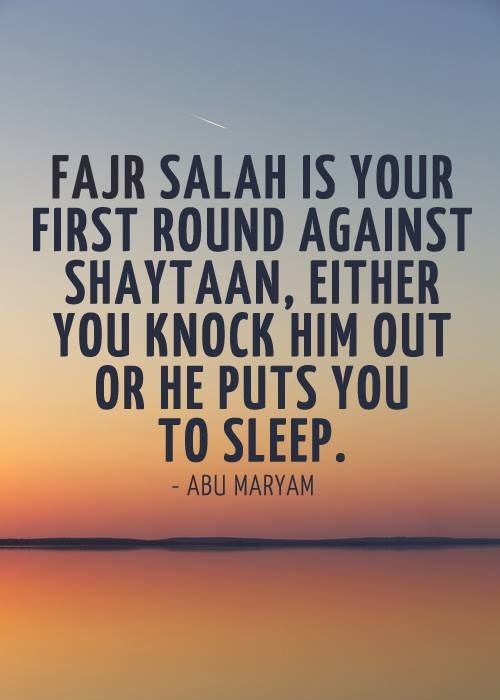 Of these two is the Fajr prayer, the performance of which is more difficult than the other prayers because it occurs at a time of rest and deep sleep. How the angels Find you? Having a sincere intention & being determind. Throwing water in the face of sleeping person. Switching on the lights to dispel sleep. Not eating too much before going to sleep. & most importantly making du3aa’ to Allaah subhanahu wa ta3aala, as it is one of the greatest source of strength & success in all things. 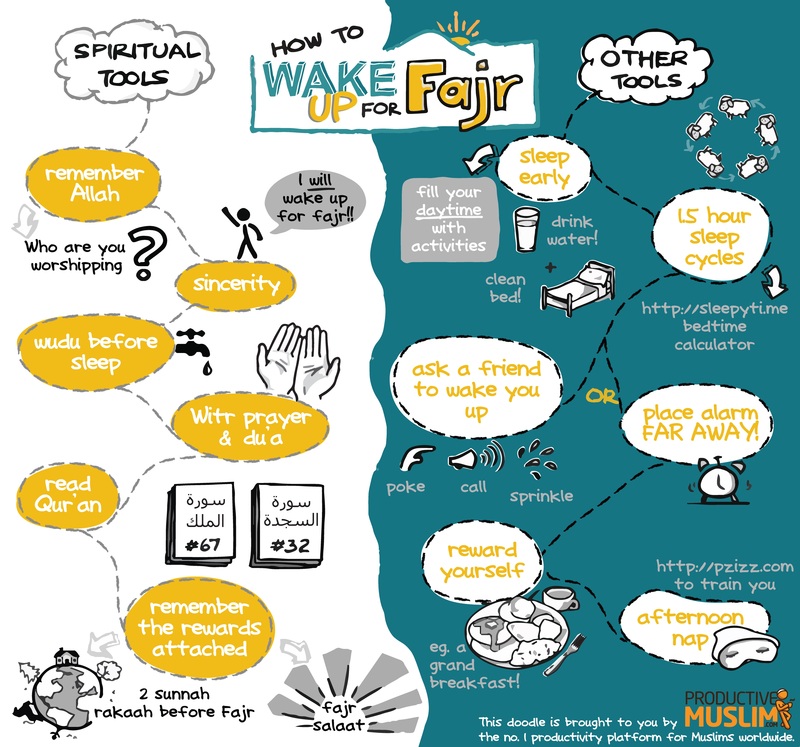 Are you neglecting the Fajr prayer? The prayer is better than the sleep!! (4) Reported by Muslim, p. 454. (6) Reported by al-Tabaraani, 7/267; Saheeh al-Jaami’, no. 6344). The sound of the adhaan echoed throughout the neighborhood. She absentmindedly thought in her head as she flipped channels with the remote. she mumbled to herself, as she settled down to watch her favorite TV program. And before she knew it, it was another show and then yet another, when all of a sudden, she realized how late it was…..the light outside had turned yellowish orange…..the birds were chirping loudly…. …the sun was almost about to set. She hurriedly got up, made wudoo’ and did 4 quick rak3aat of 3Asr as fast as she could, so that she could ‘get it over with’. Subhaan Allaah, how many of us are guilty of something like that? Okay, may be it’s not television for all of us. For some of us, it’s cooking and cleaning, ‘busy’ with the kids. And for some it’s video games and play stations; while for others it’s talking on the phone, chatting on the internet, shopping, sleeping, you name it. Or it may be for just no reason at all. We delay our prayer….and delay our prayer until the time for it is almost over and then we quickly peck the floor with our heads, thinking we are absolved of the obligation. In other words, we ‘just get it over with’. But, Brothers and sisters, do you realize what the Prophet SalAllaahu 3Alayhi wa sallam called such a prayer? He called it the ‘prayer of the hypocrite’! And its not just 3Asr. We tend to do that with all our prayers, delaying it until its time is almost up for no valid reason, except that we are just plain old lazy. Allaah says in the Qur’aan that laziness in prayer is a characteristic of the hypocrites. In fact, do you know what the best deed in the site of Allaah is? Its prayer at its time. And yet we delay it, without thinking much of it. And obviously when we delay the prayer, we rush through it, not paying attention to the rukoo’ or sujood or the proper etiquette of prayer. 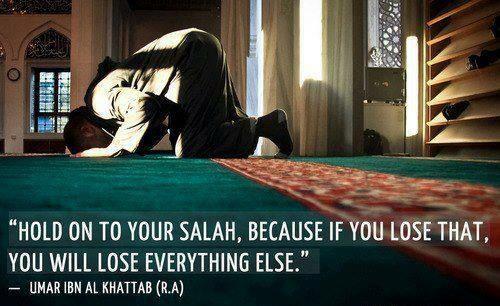 And where are we with our Salaah? The Prophet SalAllaahu 3Alayhi wa sallam used to move at a measured pace during salaah, allowing every bone to return to its place with each movement. And he commanded those who were not doing their prayer properly to do the same. Obviously if we wait till the last few moments to pray, we will not be at ease or be able to pay attention to what the Prophet SalAllaahu 3Alayhi wa Sallam) has instructed to do. Obviously, we will end up ‘stealing’ from the prayer. And you know what, we may just rush through the Salaah, ‘getting it over with’, as some of us like to say, but who knows how much of it was even accepted by Allaah? For the reward that one gets for Salaah is in proportion to the degree of khushoo he has in the prayer. We, as Muslim must hasten to prayer and with khushoo’, if we want to increase our Eemaan and good deeds. This is one of the attributes of the believers whose hearts are attached to their prayers. The Prophet SallAllaahu 3Alayhi wa sallam would be attending to his family’s needs, then when he would hear Bilaal give the adhaan, he would stop whatever he was doing and rush to pray. And he SallAllaahu 3Alayhi wa sallam said: “Five prayers which Allaah has made obligatory. Whoever does wudoo’ properly for them, prays them on time, does rukoo3 properly and has perfect khushoo3, it is a promise from Allaah that he will be forgiven, but whoever does not do this, has no such promise – if Allaah wishes, He will forgive him, and if He wishes, He will punish him.” (10). A reminder about safe guarding our salaah, which is one of the foundation of our deen. Beautiful explanation of some verses of Qur’aan by brother 3Abdul Nasir Jangda. The happiness of that guy was tremendous when a well-known company accepted him to work for it. He was over the moon as he was the only accepted candidate. If we imagine such a situation, we will laugh at the behaviour of that guy. No-one will see him but an insane and a fool person. How come can someone want to take his rights whereas he is not committed to his own obligations?! So, why most of us do the same strange action or even worse? (As we commit a worse sin against the Law of Allah the Almighty.) How can a sane person allow himself to enjoy all Allah’s graces: such as food, drink, clothes and life pleasures; whereas he doesn’t offer Allah the simplest obligatory He obligates him to do, viz. Praying?! And even if he prays, then he doesn’t pray in time or he prays like a rooster (i.e. he prays too hastily and carelessly). He neither complies with his praying nor apprehends what he says. Subhan Allah!! We are not talking about jurisprudence about which scholars disagreed or even a Sunnah that one has a choice to do or not. We are talking about ABC Islam. We are talking about praying that Allah Almighty obligates on all Muslims – whatever their conditions are. The interpreters said that what is meant by this verse is delaying prayer after its designated time.They also said : “woe” is a very deep sheer black valley in Hell. Don’t we believe in Allah’s Words? 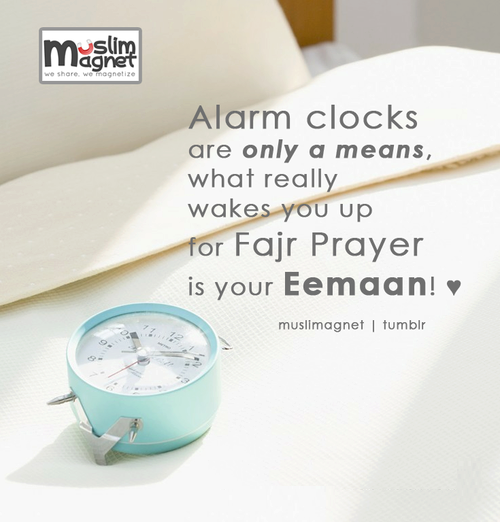 A lot of Muslims nowadays neglect Fajr prayer as if they it was not there. That’s why they pray it much later than its time. In addition, some of them pray it immediately before the Noon prayer. Others may never pray it even for compensation (Qaddaa). So why all this laziness against what Allah the Almighty deserves? Don’t we proclaim that we love Allah the Almighty more than any thing else? Once one of us loves someone a true love, he will be willing to meet him. He may keep thinking of him most of the time. Once he has a date with him, he canNOT sleep until he meets the one he loves. So, do those lazy prayers who do not pray Fajr prayer really love Allah? Do they really respect His Orders? Are they willing to meet Him?. Let’s imagine that a multi-millionaire offered one of his employees $1000 every day, just on one condition, viz. the employee must call daily at his employer’s house in the morning as to wake him up then leave. Such a simple task may take the employee 10 minutes only. This marvellously generous offer will be valid as long as the employee keeps awaking his employer regularly. On the other hand, this offer will be cancelled permanently, and the employee will be asked to return all the money he received, if he neglects to awake his employer once without an excuse. So, if you, my Muslim brother, were that employee , will you neglect to call at your employer’s house? Won’t you carefully intend to wake up daily to get the one thousand dollar? Won’t you – once you failed one morning – try with all means to prove that you were truly unable to wake up?. Doesn’t this Lord, the The Most Merciful, the Most Generous deserve that you wake up for Him every morning at about 5.30 a.m. so as to thank Him just in 5 or 10 minutes for His great blessings and his generous favours? As far as one’s punctuality on attending prayers is considered, The Prophet (peace be upon him) sees those who do not punctually attend Fajr (dawn) and Ishaa (night) Salat in congregation as being sheer hypocrites “Munafeqeen”. So what do you think of those who do not pray Fajr at all, neither in congregation nor alone (at home)? So do you like, Oh Muslim brother and sister, for the closest one to you to disavow you? So how do you neglect the Salat and cause Allah to be disavow you? Well….now what have I to do?